okay.. finally decided to give this a detailed look.. lets see what characters we have.. 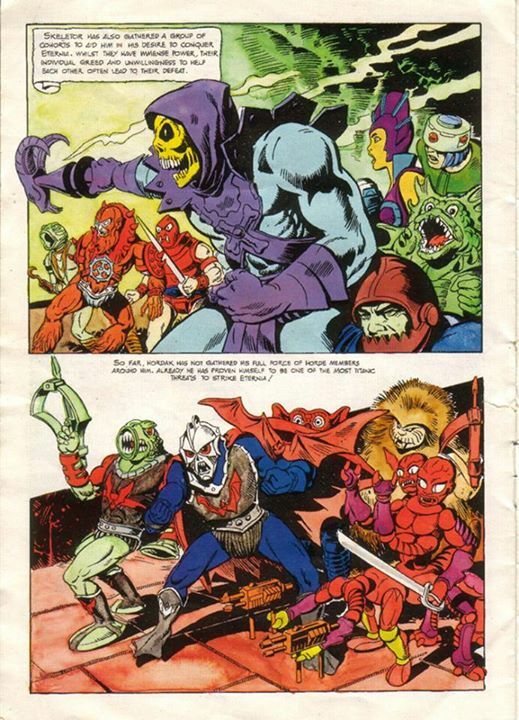 I never liked it when they referred to the good guys as the Masters of the Universe.. it’s an evil title.. so when some early stuff said Skeletor’s group wanted to be the Masters of the Universe, that makes more sense to me.. but anyway.. Unknown Guy right at back -.. erm.. okay, can still a head and a shadowed leg so.. 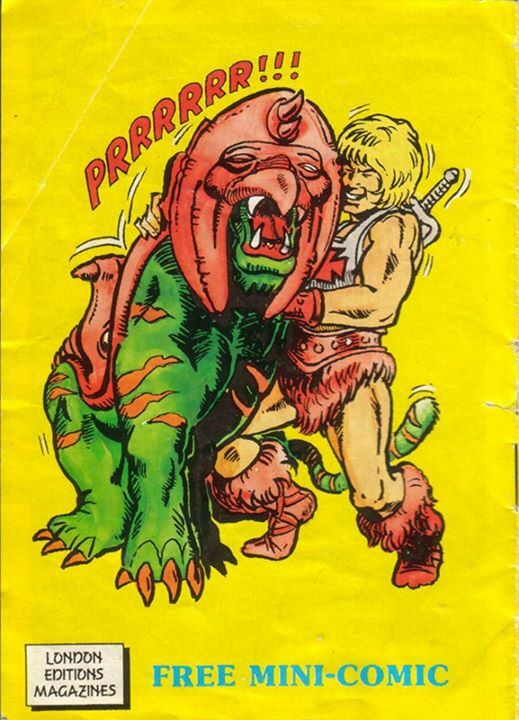 I got nothing..
Skeletor, Evil-Lyn, Trap-jaw, Beastman, Clawful, Tri-Klops..
Kobra Khan.. in pale green… I was taking off a bit cause it looked more like a weird mask then his head but.. more toy based as most of the art is, so it’s Kobra Khan. Modulok – in an interesting build.. in fact, is that Build even possible? 3 sets of arms, but you only get 2 with the figure (no, not 3 sets.. 5 arms.. the main torso is in the Middle of the body.. no, at the back.. they are just the tail section with a set of legs behind it. instead of two different guns, he carries 2 of the joined version of the guns so that design MIGHT be possible if you had two copies of Modulok (I can’t tell if both heads are the same or just if one has the wrong colour eyes. Also, is that one of the FIRST times I’ve seen Hordak’s Bat in fiction? …Oh, I forgot to say. Notice Man-E-Faces – flying! As Manic Man points out, it’s very Sy-Klone like (maybe Man-E was changed with Sy-Klone midway through illustrating, just as Kobra Khan and Clawful were)… but it wasn’t the only tiime that Man-E-Face was, bizarrely, seen flying in the U.K. comic. I’ll have to whack my brains for the issue/story, but there was at least one other instance of Man-E-Faces being shown in the air. I suspect the illustrator may have had some misinformation about Man-E’s abilities. 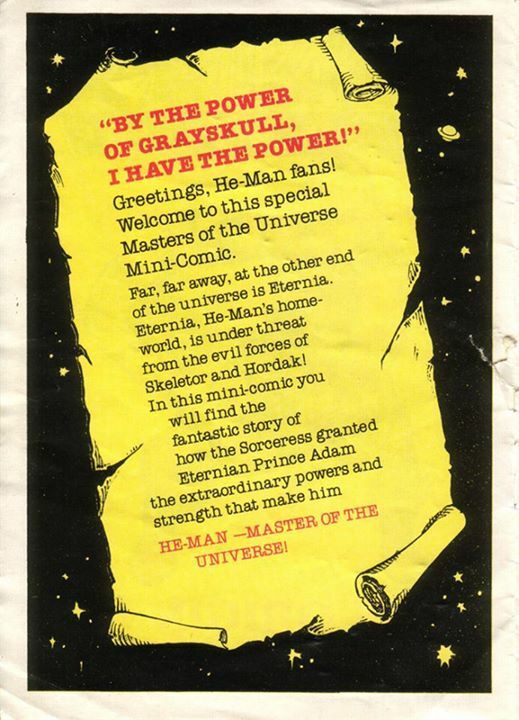 Clearing up some of the confusion on previous responses… This minicomic is a reprint of “Legend of Grayskull”, the first story to be printed in the UK London Editions comics, in issue #1, which came out in March 1986. The ‘story’ was written by Brian Clarke, lead writer and editor of the comics, and drawn by Selecciones Industriales, a Spanish art team who produced many of the artworks for UK publications at the time. 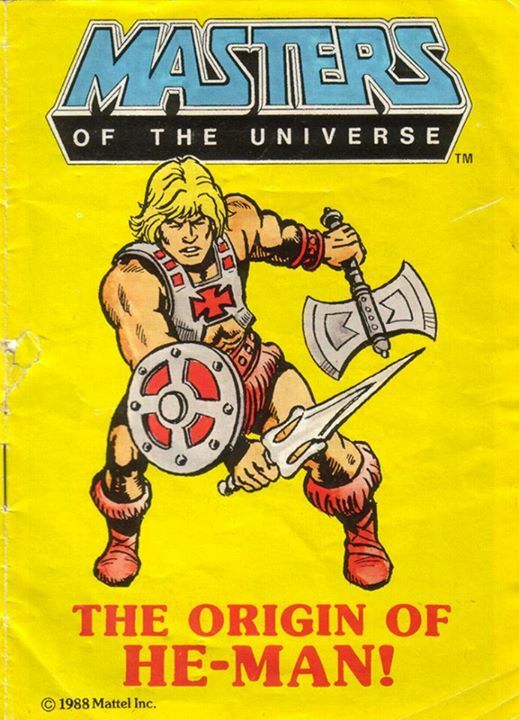 This particular minicomic which reprinted the story (most of which was originally in black and white but was coloured specially for this minicomic) was given away as a freebie with one of the later issues of the MOTU fortnightly comic in about 1988. Man-E-Faces, meanwhile, had the ability to fly in the German Interpart-Condor Comics, which I think slightly predated the UK Comics. It is quite possible the artist here used those comics for reference. 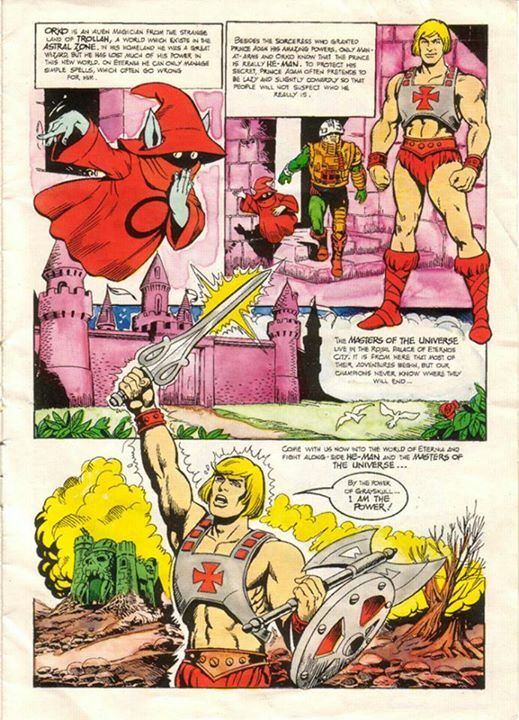 One of the stories that showed him flying was reprinted in the UK MOTU Special published in 1987, which was published by London Editions but featured stories reprinted from the German Comics. 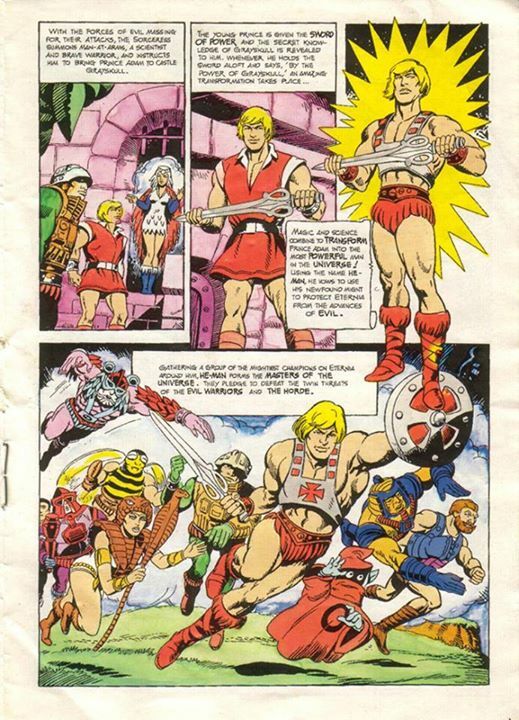 Man-E-Faces only appeared in one regular story in the UK Comics in the Adventure Magazine issue #5, and he did not possess the power of flight in that. Aidan, thanks so much for the additional information on this comic. I posted this way back when I was just starting the blog, with absolutely zero analysis. I wouldn’t do anything like that today, but I was still figuring out what the blog was going to entail. Even now I haven’t done any real research on the UK comics. In any case, I wholeheartedly recommend everyone checking out Aidan’s UK Comics fan site – it’s really the authoritative source on the subject! I’ll add a link to it on my links page today. The UK comics never arrived in Italy and I discovered them only recently. Well, not bad stuff but with a lot of high and low. However there is an interesting story about Webstor and He-Man forced to work togheter: in the story Webstor was depicted as very competent and intelligent at the point that an impressed He-Man offered him to join the good guys. 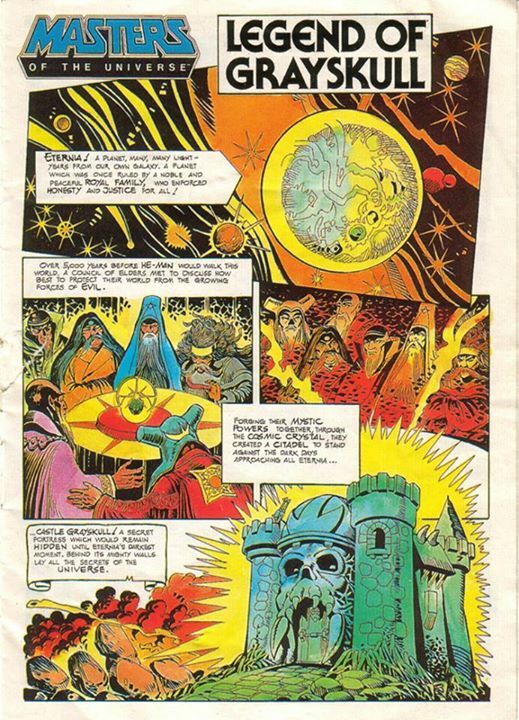 Webstor was portrayed BRILLIANTLY in the UK Comics. Easily the best portrayal of him in any media. There was only a small handful of stories that gave him a spotlight role, which is a shame, for he was written extremely well and made out to be one of the most intriguing and psychologically complex villains.